To the best of our knowledge, this world functions on a basis of laws. Or, at least that is how we have come to classify the naturally occurring events. These laws fascinate me. The law of conservation of mass, the laws of motion, and the law of conservation of energy are a handful that readily come to mind. Their implications produce a fun little game I like to play with myself. I am always, often unconsciously, looking for things that act the way they do as a direct result of one of these laws. For example, think about the law of the conservation of energy and an angler's cast. Ultimately what places the fly on the very end of the line at that far distance is a direct result of the energy from the sun. I'll bet you have never thought of your casts as a result of solar energy. The sun heats the earth, and transfers energy into plants. The plants convert that energy into a form that can be consumed by the plant. The plant is eaten by animals, carrying that same energy into the animal, and we get the energy by either eating the plant or another animal that ate the plant. That energy is then used by our bodies, allowing our hearts to beat, blood to flow, and muscles to move. Our magnificent creation of a body then takes that same energy, which originally came from the sun, and thrusts a flexible, whip-like rod backward and forward in the air, allowing the energy to transfer from our arm to our wrist, then down to the tip of the rod, and into the line, which pulls the fly along, eventually placing it delicately (or not so for streamer chuckers) on the water. Multiple laws could be referred to in the whole process, and I find the connections fascinating. Ain't no harm in nerding out. Laws are much easier to observe in the physical world. The thing is, there are laws that concern people, but with the malleable nature of humanity, the laws are much harder to see and prove. So much so that the sciences that surround these studies are often referred to as soft or pseudo-sciences. In a nutshell, it's hard to know our influence on other people, or theirs on us. These kinds of things require long-term studies, which are impractical, unwieldy, and often lack enough control to be consistently accurate. But, we can make some assumptions, form some opinions, and identify some overall trends, which can be just as interesting to explore. Sometimes it is enough to be able to see or sense a thing, but not be able to explain it. A good friend of mine introduced me to this idea, and through my little personal game of looking for validation of laws, I have come to believe it as an accurate assessment. I guess I would even go so far as to call it the law of three. It is that, for every person you show a fishing location to, they will show it to at least three others. They may not spread it at first, but by and by it will be spread. I have to interject here, that this rule applies to those who are actively pursuing angling, not really those who go once or twice a year. The implication is that exponential growth will eventually follow. The real question is, is this a bad thing? I found myself asking this question as I stood in the river, fishing for trout in a run alongside 10 other anglers, who had all walked up while I was already fishing the run. I marveled for a moment, that I was in Idaho, trout fishing, not steelhead fishing, and in moments it had become a "combat fishing" scenario. I casted for a bit longer, and then called it a day. There is no doubt about it. Social media has changed the game. 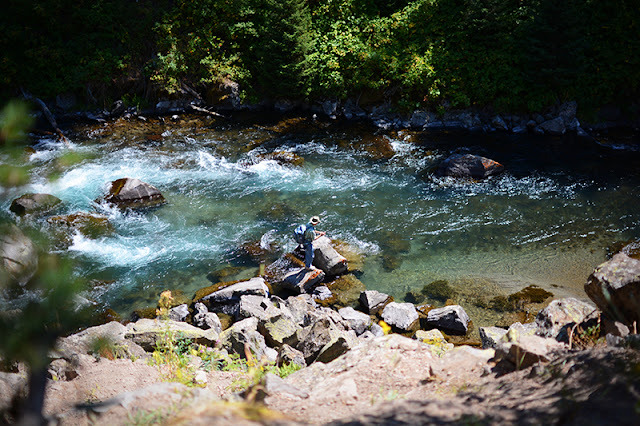 Many people's definition of exploring new water is scouring the internet for new pictures and information of areas that are already known to other anglers. Pictures motivate and give little clues. It is much less of an independent boots-on-the-ground endeavor. It makes me somewhat sad to see, but just because it is not my approach does not mean it is wrong, or that I have not or will not benefit from the process. I have found my fair share of help from google earth, and I have some pretty sharp friends who do quite well at the game. The internet tools we have are powerful, and not altogether bad. What does bother me is the bartering I occasionally see happening. The "I'll show you mine if you show me yours" approach. I consider myself a pretty nice guy, who is pretty slow to anger, but this approach gets under my skin pretty quick, especially when it involves waters that I care about, and frequent. I struggle to find balance with these issues. I can't even say that the "bartering" is a wrong way to go about it. I just don't personally like it because of my own scarcity mentality. Who gets to be in the "circle of trust" and who should be left out? How many people fishing an area is too much? If I had my druthers, I would never see another angler fishing the water I have chosen to fish in any given outing. I like my solitude. Its one reason I have become a much more nocturnal angler. But, even that is losing its solitude. In many ways I blame myself. Social media has created a new baseline. It is taking a lot of the "blood, sweat, and tears" out of the exploration, and making it more of a "pay to play" endeavor. My hands are not clean in the process, as I have learned, and it has led me to seriously reconsider my involvement on social media as of late. I still hold to the idea, as I have mentioned in previous posts, that many of the problems with social media are a symptom of individuals' lack of respect. It's the same argument that surrounds gun control issues. People kill people, regardless of the guns, but a gun can certainly make the process easier. People ruin the solitude and quality of a location, but social media certainly makes it easier. There will always be those who use social media because they love to fish, and would go on happily fishing even without cameras and Instagram posts. But, I wonder who wouldn't be seen on the river if there were no cameras. Think about that one for a moment, it goes more than one way. Social media speeds the process presented by the rule of three, but the rule really comes into play with in-person interactions. When a person is personally escorted to a location, shown specifically where to fish, is given effective tools to do so, and is then shown how to, they have now been given a gift. It is a gift born of someone else's exploration and effort. The thing is, everybody has friends, or at least acquaintances with similar interests, and we cannot, or will not, always be fishing with the same people. So don't be surprised when you run into other people fishing your regular haunts, and find that you have a common friend, because, well, the rule of three. It's just as much of a law as any other. This brings up questions: Do we not share? Is social media more of a problem than a benefit? If someone chooses to share a location with someone, how do they do it responsibly and respectfully? Is it all just a river etiquette thing? Will the rise in pressure eventually die away? Is less more, or is more less? What do you get out of fly fishing versus what someone else might get out of it? Is one wrong while the other is right? In the end, if the rule holds true, I just might see you on the river. Who knows, maybe I already have.